Tickets for all gigs are available through online purchase. Follow the links below. Tickets can also be purchased through retail locations nationwide for the gigs in Waterford City, Banteer, Kilworth, Dingle, Listowel, & Dublin. Tickets may also be available for purchase at the door, although we recommend advance purchase to avoid disappointment, especially for the final gig on May 19 in the intimate confines of Dublin’s Unitarian Church. Chart-toppin’ Nashville-based Kristy Cox is on quite the roll, and she’s rolling right into Ireland! Capturing attention with her powerful singing style, youthful energy-infused bluegrass, and song writing acumen, she continues to enjoy radio & television success in both the US and in her native Australia where she’s a multi award-winning Australian Country Music Awards Golden Guitar recipient – most recently she picked up the 2019 Golden Guitar for Bluegrass Album of the Year for early 2018’s Ricochet. Kristy has appeared at major festivals across Australia, Europe and the US, including an official showcase at the International Bluegrass Music Association (IBMA) Convention in 2015; she was shortlisted by the IBMA 4 years running for New Artist of the Year and Female Vocalist of the Year. For her current & first release after signing with the Virginia-based Mountain Fever label, early 2018’s Ricochet (see below), Kristy teamed up with renowned songwriter Jerry Salley. Proving to be quite the formidable pairing in writing and recording great bluegrass and acoustic country music, the album debuted at #1 on the Billboard Charts for Bluegrass Album and was shortlisted for the GRAMMY award for Best Bluegrass Album. 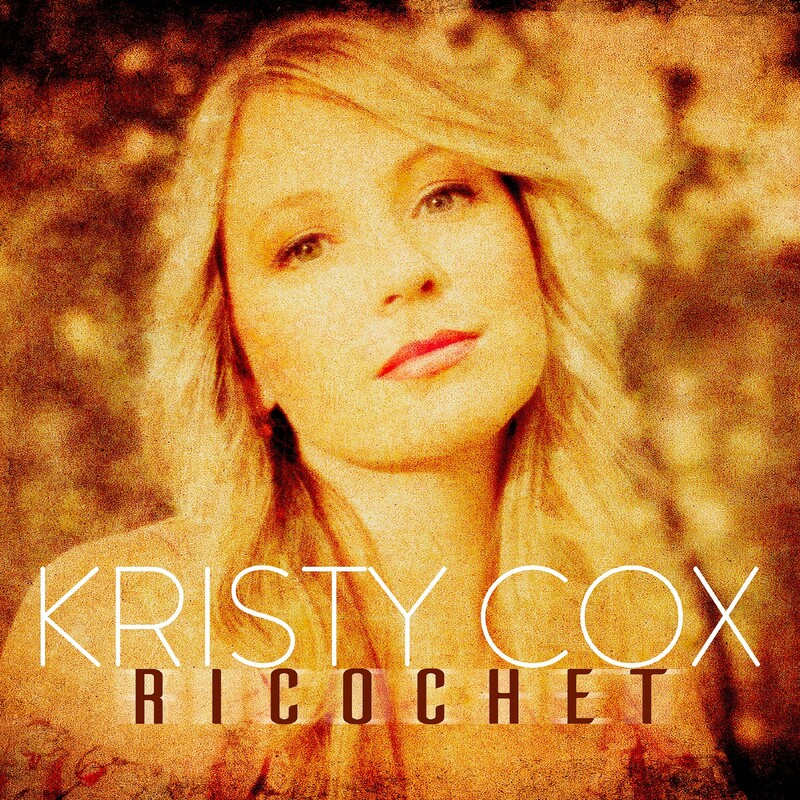 ‘Ricochet’, the first single release and title track off the album, took Kristy to the top of the Bluegrass Today Radio charts for two successive weeks; she hit #1 on the chart again with the subsequent Ricochet single release ‘I Can Almost Smell The Smoke’ while ‘South To North Carolina’, the third & current release off the album, was Sirius XM’s Bluegrass Junction #1 played record for January 2019. Kristy Cox is making a repeat visit to my favorites list. This Australian transplant captured lightning in a bottle when she teamed up with producer and writer Jerry Salley a couple of years ago, and the combination is still magical. On Ricochet, Cox steps it up a notch or two as a vocalist, making her one of the best in the business. Lots of strong songs here, but my favorite is a heart-breaking duet with Brandon Rickman on ‘A Bed This Cold’, which Rickman wrote with Salley. 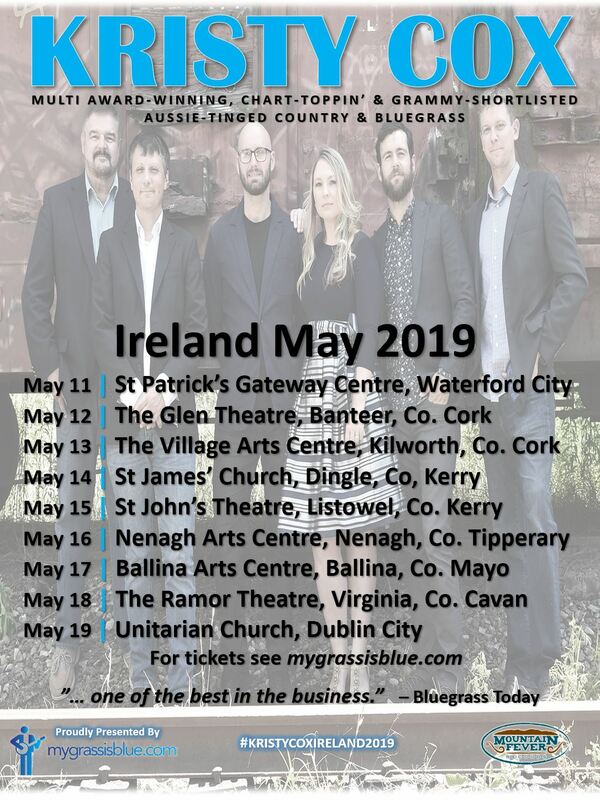 “… one of the best in the business” according to Bluegrass Today, Kristy is excited to be making her very first visit to Ireland with her band. She’ll also be accompanied by her husband Travis, Australia’s premier honky tonk singer. Bluegrass. Super. Bluegrass & country. Even better. Save a date (or two). You don’t want to miss this. The 9-gig tour kicks off in Waterford on May 11. … one of the best in the business. For 2018’s #1 Billboard Album Debut & GRAMMY shortlisted Ricochet, Kristy teamed up with producer and renowned songwriter Jerry Salley; seven of the ten tracks on the album were co-written by one or both of them. Proving to be quite the formidable pairing in writing and recording great bluegrass and acoustic country music, to date the album has spurned two Bluegrass Today #1 singles for ‘Ricochet‘ (which for good measure also hit the top of the Australian Country Radio Chart) and ‘I Can Almost Smell The Smoke’. Other obvious album highlights include the opening track, ‘South To North Carolina’ (Cox/Salley/Michael Rogers), which will resonate well with die-hard bluegrass fans and proves that Aussie Cox is equally at home in the US, both musically and geographically; and ‘A Bed This Cold’, a duet with Brandon Rickman of the Lonesome River Band, who also penned the song with Salley. Additional guest vocalists include Salley, Rogers, Maggie Salley, Donna Ulisse, and Josh Swift. Adding to this already solid recording is an all-star cast of musicians: Jason Roller (fiddle/guitar); Justin Moses (Dobro/mandolin); Aaron McDarris (banjo); and Mike Bub (bass). Ricochet will likely find a rightful spot among listener’s favourites, thereby giving Kristy Cox some well-deserved longevity in bluegrass music. The title track off Kristy’s 2018 Mountain Fever release Ricochet, a release David Morris of Bluegrass Today included in his favourite 12 recordings of 2018. Kristy Cox is making a repeat visit to my favorites list. This Australian transplant captured lightning in a bottle when she teamed up with producer and writer Jerry Salley a couple of years ago, and the combination is still magical. On Ricochet, Cox steps it up a notch or two as a vocalist, making her one of the best in the business. Lots of strong songs here, but my favorite is a heartbreaking duet with Brandon Rickman on ‘A Bed This Cold’, which Rickman wrote with Salley. A mid-2018 in-studio interview with Kristy in which she gives insights into her music. As country as it gets! Kristy & husband Travis on “One of Those Too”. Looking back to the recording of Kristy’s first US release, 2014’s ‘Living For The Moment’ on Pisgah Ridge/Mountain Home label.